It used to be that when we wanted to express that a person took on many different roles in life, we would say he or she "wore many hats." These days, it might be more accurate to say he or she "carries many bags." It seems that every role we play in life requires a different bag. There are bags we use for toting, bags we use for shopping, gym bags, handbags, make up bags, and even bags we use to clean up after our dogs. With all these roles, it's safe to say we need a little balance in our lives, which brings us to another bag: the yoga bag. At Resveralife, we know that even the most dedicated yogi has a lot more to do in life than meditate. That's why we created a bag that lets you make an easy transition from whatever it is you've got on your agenda to the gym. 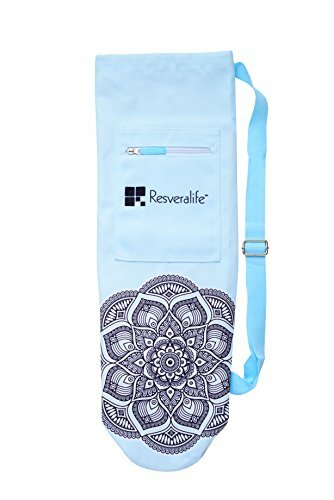 The Resveralife Yoga Bag is durable and stylish with a drawstring closure and comfortable strap for carrying over the shoulder or across the body. Its spiritually inspired design is suitable for both men and women, and its zipper pocket is perfect for storing accessories such as cell phones, wallets, or keys. Resveralife knows how hard it is to fit everything into your busy schedule. Our yoga bag is just one way we're making sure you can fit some time for relaxation too. FITS ALL SIZES - This yoga workout bag easily fits yoga mats up to 24 inches. WASHABLE AND DURABLE - Canvas cotton material is durable and machine washable for easy cleaning and care. UNISEX DESIGN - The light blue color and floral mandala design makes this yoga mat gym bag attractive and appropriate for both men and women. EASY TO CARRY - This yoga mat carrying bag comes with drawstrings and comfortable straps that allow you to carry the bag cross body or over the shoulder. ZIPPER POCKET - One zipper pocket makes it easy to store accessories and essentials such as cell phones, keys, or wallets in the Resveralife Yoga Mat Travel Bag. If you have any questions about this product by Resveralife, contact us by completing and submitting the form below. If you are looking for a specif part number, please include it with your message.